Titania Sleeping by Richard Dadd, 1817-1886. 1841. Oil on canvas. 23 1/2 x 30 1/2 inches. Provenance: H. Farrer, who bought the painting from the Royal Academy exhibition of 1841; Samuel Ashton, (in 1857); Thomas Ashton; Col. C. H. Wilkinson, of Worcester College, Oxford; Col. Wilkinson's sale, Sotheby's, 25 May 1960, lot 69; Miss V. R. Levine. [It] is conceived as a spiral snail's shell shape, set slightly obliquely to the surface plane of the picture, arching round from the left-hand side of the cave's mouth and swirling across the foreground through the trail of toadstools which are scattered over the grass, until it meets up with the dancing figures on the left. The tightness of the structure and the complete integration of the figures with the natural world of their surroundings creates, as in all Dadd's fairy paintings, the feeling of a self-contained microcosm, existing entirely on its own terms and in its own context. 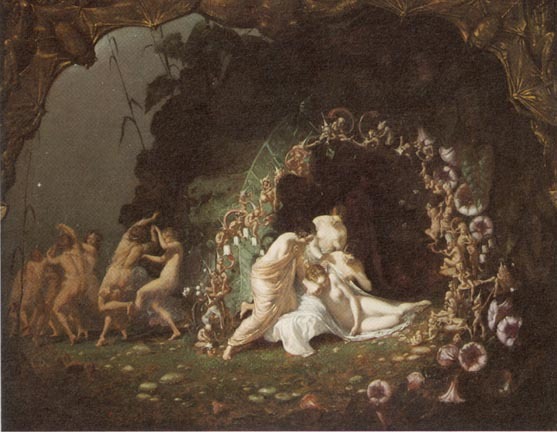 A Midsummer Night's Dream proved one of the most potent sources of subjects and inspiration to Romantic painters. Daniel Maclise had previously treated the far more disturbing subject of The Disenchantment of Bottom Act IV, scene 2 (ex Iveagh collection, Elveden Hall), a painting with something of the same dynamic force and luminous colour scheme as Dadd's Titania Sleeping. Newall, Christopher. A Celebration of British and European Painting of the 19th and 20th Centuries. London: Peter Nahum, nd [1999?]. Pp. 10-12. Peter Nahum Ltd, London has most generously given its permission to use in the Victorian Web information, images, and text from its catalogues, and this generosity has led to the creation of hundreds of the site's most valuable documents on painting, drawing, and sculpture. The copyright on text and images from their catalogues remains, of course, with Peter Nahum Ltd.